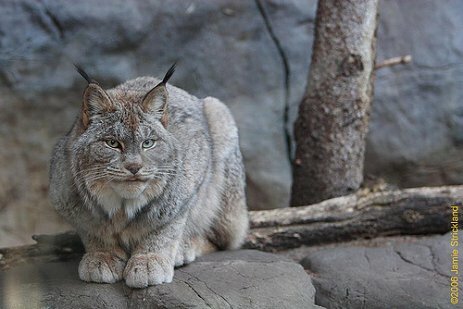 The Canadian Lynx is one animal that is perfectly designed for the job of feeding itself. Not all animals are so lucky, but the lynx is. It has one major problem that it cannot control. That problem is food. You see, the snowshoe hare population collapses every ten years. Its natures method of controlling the population. Because the hares do what hares do best the forest becomes saturated with the little bunnies so a large percentage of the population die off and of course, there goes supper for the lynx. The lynx population fluctuates up and down in concert with the hares. Not all lynx eat hares exclusively. Some will eat mice, squirrels, birds and deer. If you ever see a snowshoe hare in winter with its fur covered paws spread wide on soft snow and running at full speed you may wonder how any animal could catch it. Similarly if you ever see a lynx chasing it you will wonder how any hare could ever escape being caught. Both are beautifully adapted for winter pursuit. Advantage goes to the lynx because it has long hind legs perfectly designed for speed. The paws are huge for the animals size and are covered with fur to allow it to speed over thick snow as if on bare ground. The lynx mainly hunts at night. Since they live in isolation and they are chiefly active at night, they are seldom seen in the wild. Another reason they are tough to find is that they patrol large territories. It has been my good luck to have encountered a few Canadian Lynx in the wild. They are very beautiful animals with amazing fur coats that are a very pale grey/white in winter and tawny brown in summer. I stood not 15 feet from one animal while it looked me over for a few minutes before quietly striding away. I saw another that had been caught by a paw in a snare. It was released by a conversation officer while it remained quite but was held down by a pole. Once it was released it remained where it was for a couple of minutes and then very slowly walked away stopping every few steps to turn and observe us. No speedy retreat as you might expect. They just do not panic. The mountains surrounding Whistler have a good population of the incredibly beautiful Canadian Lynx. Keep your eyes wide open and you might just see one of natures wonderful creatures.